Circuit breakers are the ‘safety stop’ signs of your onboard electrical system, they secure the electrical circuit against overload or short circuits. 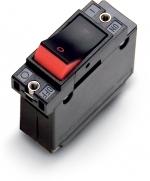 For equipment that is connected directly to the circuit breakers - such as lighting - they can also act as on/off switches. Double pole breakers are mostly used for 230 V systems, which interrupt the current both in the phase and neutral wires. Mastervolt supplies a wide variety of single pole and double pole circuit breakers, that satisfy all the requirements of CE/UL/CSA and ABYC.